Can i announce my game here? I ported to Android an old solitaire game for PocketPC from almost a decade ago. I used PocketFrog back then. Please try it out. And give constructive comments and rating. 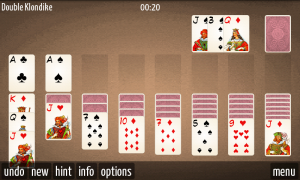 There is a FREE version on the Android Market with 14 solitaire games. Paid version has 70 games. There is also a Samsung Bada version available. Sure. Was this developed in Java, or did you use the NDK to port C / C++ code over?